ICD-10 implementations have competition for resources within hospitals. According to HIMSS Analytics, Stage seven healthcare organizations support the true sharing and use of patient data that ultimately improves process performance, quality of care, and patient safety. While this is a laudable achievement, only 55 hospitals have made this goal and many are part of the Kaiser health system. 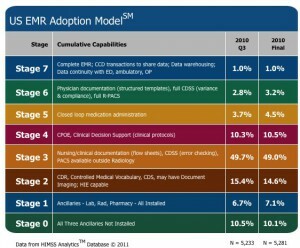 Achieving meaningful use of electronic health records (a term used interchangeably with electronic medical record) has caused resource contention with the implementation of other standards such as the move to the new medical coding standard ICD-10 and the electronic data interchange standard HIPAA 5010. ICD-10 includes revised diagnosis codes as well as procedure codes that would then populate future electronic health record systems. ICD 10 steering committees at many hospitals are just starting to meet, despite the fact that the WEDI / NCHICA timeline of best practices for implementation suggested health care providers should have started the move from ICD9 to ICD10 a year ago. ICD-10 has its own process and IT impacts which are distinct from EMR / EHR but that tend to overlap. Full, paperless EHR implementation is an important foundation for enabling Accountable Care Organizations, and enabling usable Health Information Exchanges. 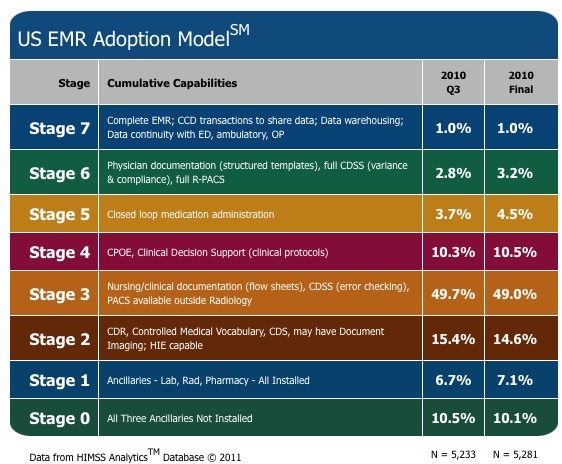 Ten percent (10%) of hospitals support Computerized Physician Order Entry (CPOE) and over seventy percent (70%) have not moved beyond stage three. The fact that such a small percentage of health care providers have achieved this level provides some insight into the challenges with ICD 10 which is a complete overhaul of the diagnosis and procedure coding system. In Stage 7, the hospital is truly paperless. Clinical information can be readily shared …with all entities within health information exchange networks (i.e. other hospitals, ambulatory clinics, sub-acute environments, employers, payers and patients). This stage allows … the true sharing and use of health and wellness information by consumers and providers alike,” according to HIMSS Analytics. The co-mingling of these initiatives does have one large impact on quality measures for health care. ICD-10 is expected to increase the complexity of quality measures ten-fold. No similar set of Stages have been published for ICD-10, only a roadmap to compliance. In fact, ICD-10 compliance has been described as a “single event” for all HIPAA Covered Entities, with no trial run to ensure that the health care system will be in compliance. As October 1, 2013 looms ever closer, the Wall Street Journal has labeled ICD-10 “the ‘Y2K’ problem in health care.” As 2011 plays out, ICD-10 implementations should gain momentum. In a few months the U.S. Health and Human Services department will have more visibility into the level of compliance expected and we look forward to seeing the new survey data.